Welcome to an amateur observatory dedicated to providing research-grade observations for use by professional astronomers and programs. The current focus (pun intended) of the observatory is on lightcurve photometry of variable stars. Lightcurves are plots of a series of brightness measurements that show the changes of brightness over time. They are used to determine some of the properties of the object. 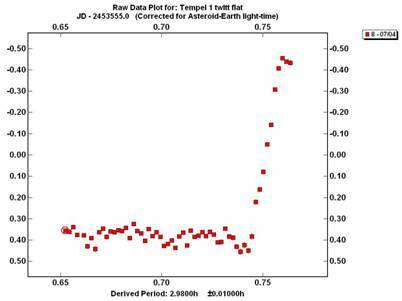 For example, the lightcurve below, observed at Antelope Hills Observatory, shows the increase in brightness of Comet Tempel 1 after its collision with the Deep Impact probe. Comet Tempel 1, July 4, 2005. Brightness increases as you go up the y-axis of the graph.